How to create a fast motion video? 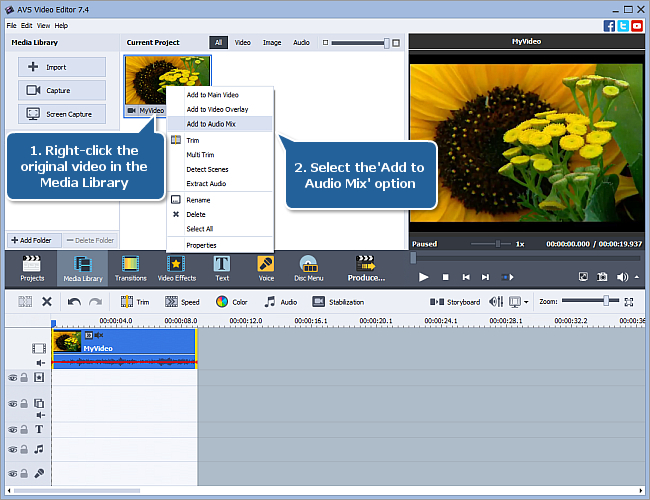 AVS Video Editor allows you to change the playback speed of your video. You might want to use this feature to correct too slow scenes by speeding them up. This effect allows to make a certain episode more dynamic or funny. It's also possible to create an interesting voice effect by adjusting the playback speed. A fast speed makes the voice sound high-pitched. Once you import your video and place it to the Timeline, you can follow the steps of this guide to easily produce the fast forward effect. If you want to speed up your entire video record, just select the video on the timeline by left-clicking it and proceed to the next step. To speed up a certain episode of your video, move the slider along the Timeline to find the beginning of the scene, then click the Split button. Move the slider to the end of the necessary scene and click the Split button once again. When the necessary video on the timeline is selected, click the button on the timeline toolbar above. In a new window that opens adjust the speed of your video. The Speed field shows the current speed value that is set to 1x by default and corresponds to the normal speed. Click the button and adjust the speed value by dragging the slider. To speed up your video, drag the slider to the right. The values from 1.15x to 12x increase the playback speed. 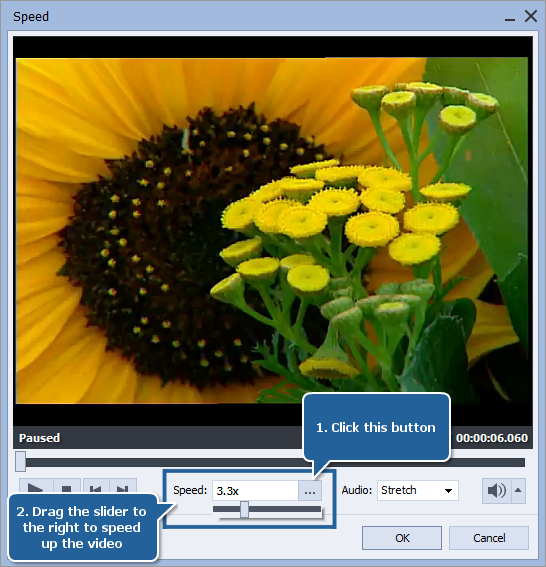 If your video file includes an audio track, the audio playback speed can also be changed according to the video stream speed or it can be switched off. The Stretch option is selected by default in the Audio drop-down menu. 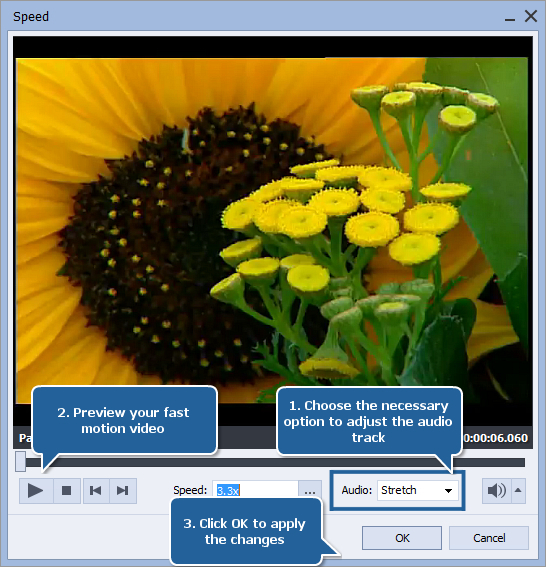 It allows to adjust the audio track speed in accordance with the speed of your video. Choose the Mute option to switch off the accompanying audio playback. You can preview the video clip using the player buttons to see if the speed adjustments you've made suit your needs. If you are satisfied with your fast motion video, click the OK button to accept the changes and close the Speed window. The video file with the applied Fast Motion effect is marked by this sign in the Timeline/Storyboard Area. The icon means that the sound is switched off. If you decide to mute the original audio track, you can add another one instead of the original sound. 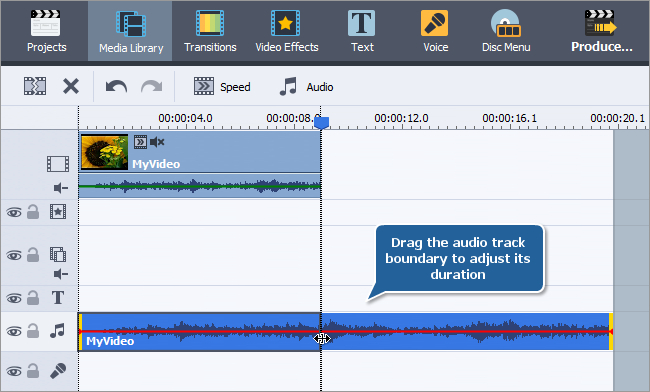 Drag the necessary audio track from the Media Library to the Audio Mix line of the timeline. There is also a possibility to keep the original soundtrack at a normal speed: right-click the source video in the Media Library and select the Add to Audio Mix option from the menu to add the original video sound to the Audio Mix line of the timeline. In this case, you will need to adjust the audio track duration so that it corresponds to your video duration, as the duration of your fast motion video is now reduced. Drag the right audio track boundary to the left to decrease its duration. Note: to learn more on how to adjust a soundtrack, apply audio effects or mix several audio tracks using AVS Video Editor, you can refer to our Online Help. That's all. You've just created a professional video effect by yourself in a few mouse clicks.